While this set may seem the same as that earlier reviewed for the A and F model Eduard kits, it is specifically molded for the 190D variants recently kitted. Like the earlier set, this one provides easy to install closed gun covers for these very nice kits. 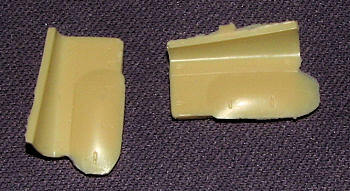 It is a simple matter to remove the small pour stub, lightly sand away any flash film and install these. I'm sure it will be something you will be looking into. Thanks to Loon Models for the review sample. You can get these from www.rollmodels.com, some other fine on-line shops like GreatModels or your local retail hobby store. If they don't carry them, ask for them.